Conveniently, my birthday falls around the family day weekend. The last few years we’ve celebrated by going out of town for the three-day weekend. This year, we decided to take advantage of the direct Westjet flight from Edmonton to Comox and visit my friend Christopher and spend the weekend on Vancouver Island. Christopher was very excited to show us around. We kicked our weekend off with a hike along the shore of Comox Lake before we joined the locals for a roast-beef-dinner at the Waverley Hotel in Cumberland. We also picked up some locally brewed Raven’s Moon craft cider (and bootleg BC wine) before heading home to binge watch the winter Olympics. Saturday morning we were ready to kick it to west coast of Vancouver Island. Christopher suggested picking up some seafood before we set off, so we stopped in at Fanny Bay Oysters for oysters and crab, and we also grabbed some clams from Mac’s Oysters, where I was blown away by the massive piles of shucked oyster shells. We arrived in Tofino to a torrential downpour, so we decided to wait out the storm with an incredible view from the restaurant in the Wickaninnish Inn. Eventually the sun came out so we had a chance to walk the shore as the tide was going out. We were hungry, so we stopped in for a bite at the famous Tacofino van parked out back behind a surf shop. While waiting for tacos I always recommend deep lunges. Christopher & The Spaniard trying to hide from the wind at Long Beach. 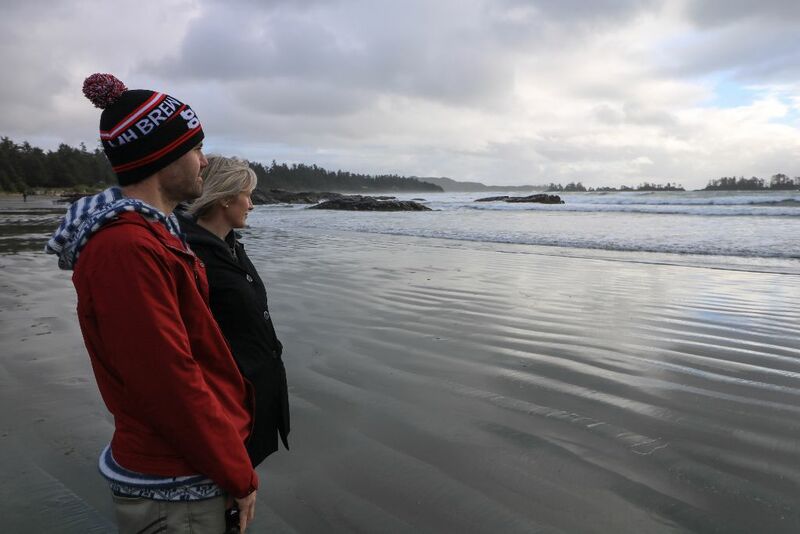 We strolled around Tofino taking in some of the sights like the Roy Henry Vickers art gallery. Eventually we made our way back south towards Ucluelet, stopping in for a windy sunset at Long Beach. Christopher had stayed at Fortune Cove in Ucluelet in the past and we were so glad to have the recommendation! The Cypress Cabin was adorable and the perfect home for a night to enjoy our home-cooked (and shucked) seafood feast. Huge thanks to Christopher for shucking three dozen oysters for us to enjoy as well as cleaning the crabs! Before the sun went down our hosts recommended we check out the lighthouse in Ucluelet. Christopher convinced us to brave the winds by the lighthouse, but it was too intense. I thought we were going to get blown away. The next morning I wasn’t feeling great, but after willing myself to feel better – we decided to take a walk along the Wild Pacific Trail. Silliness ensued and The Spaniard and I got into an intense game of push your loved one off the log. Later on we stumbled upon the perfect tree which I am sure has idiots like Christopher and I playing on it all day taking photos. Eventually we made our way back into town for lunch and to say goodbye to the funky octopus. From there – things went a bit downhill for me. Either I had food poisoning or I picked up some stomach bug. I’m not sure – I can just tell you the 2.5 hour curvy drive back across the island was challenging. Once we were back at Christopher’s place – things went from sick to sicker. While I look back at the photos with positive memories, the last 24 hours of our trip was a memory I would like to erase. I guess that means we’ll just have to head back to the Comox Valley and visit Christopher for another dose of Vancouver Island fun. Christopher – thank you so much for the hospitality and we hope to put your shucking skills to good use again soon!